Simply post, discuss or joke about any currently airing anime you want. For Anime you've been watching that aren't currently airing refer to Cleb's weekly thread. But what if the anime I want to talk about hasn't aired yet? No problem, just post a comment here once the episode has aired, these threads aren't meant to last one single day. Unfortunately I haven't had time to sit down and keep up with the weekly episodes this week, as I caught a bad case of addiction to a new video game. 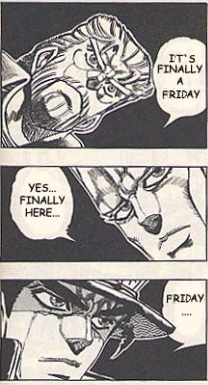 Technically I'm late again, but it's still Friday somewhere right? It's Friday once more, and may I say, you look stunning today?